I have always been a reader. I love books, all the characters you meet, grow to love or hate, and the exciting places stories take you. When I wasn’t able to read, I listened to audio books on tape or CD. Still do. So at any given time, I probably have an audio book and an e-book or paperback going. 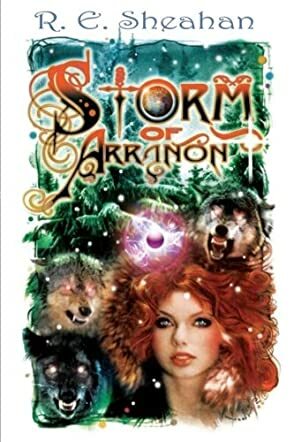 A true storm takes the two alien worlds of Korin and Arranon by surprise as Erynn begins to discover her unknown abilities. Faced with the possible destruction of her home world and a related planet, Erynn and her friends from the academy, the Anbas warriors and other unexpected sources, fight for everything they hold dear. With the discovery that she belongs to the secret world of dual parentage children, Erynn takes hints left for her by her long lost father to find the pathways to uncover her unlimited power. Surprised by the extent and intensity of her unusual gifts, she depends on the help and advice of others she comes to love. Erynn is determined to not fail the important role she has to play to make sure the world as she and her friends know it stays free and unharmed. "Storm of Arranon" by R. E. Sheahan is a quick paced, exciting read that begs for the pages to be turned. A wonderful alien world has been created and is populated with amazing, yet realistic, characters and animals, not to mention a few surprises. While this is essentially a story of good vs. evil and the discovery of new emotions that develop in the course of growing up, it is told with humor, insight and well-developed characters. The plot unfolds quickly as the serious business of saving the planet is addressed but there is still time for the discovery of fantastic new things and the forging of friendships that will be needed as the characters move into the future.